Theater and landscape have been mutually nurtured over time. Since antiquity, the art of theatrical performance is associated with landscape. In ancient Greece, the cult of Dionysus, god of self-transcendence, ecstasy and poetic theater, gives birth to a circular building outdoor named "chaos swirling." From the sixth century BC, a semicircular stage device, dedicated to representations of myths related to agriculture and land, is part of the landscape. The hemicycle, always built on a mountainside, chosen for its perfect acoustics, offers a panoramic view over the city and the plain while taking advantage of the topography. Until the fifteenth century, theater, whatever its form of expression, takes place outdoors. During the Renaissance, under the influence of painting and literature, the notion of landscape is modified. Humanism and the return to ancient sources foster learned forms of theater. With new techniques of perspective geometry, Sebastiano Serlio based on the principles of Vitruvius, constructed illusion of real machines. Simultaneously, archaeological excavations have uncovered the ruins of Roman theaters. These discoveries inspire landscape architects, first in Italy and in France. Different arrangements of the garden (exedras, monumental fountains, amphitheatres, pools, temples) evoke theatrical forms and different ground levels create a variety of stands offering a panoramic view of the landscape. The garden becomes itself an object of spectacle with this double-play on the theme of reciprocal garden-theater and theater-garden, participating in the staging of performances and the garden itself, a new structure was specifically born in Italy in the seventeenth century: the green open air theater. The outdoor theater is seen as a garden ornament, shapes defined by vegetation structure, often decorated with sculptures. The Villa Reale in Marlia, near Lucca, houses a fine example of green open-air theater dating back to 1642. The raised stage, fully grassed, describes a semicircle surrounded by a palisade of monumental yews, featuring animated scenes and statues on the theme of theater sets and topiaries. The seventeenth century is the century of great theater, which became an institution. Italian gardens of the Renaissance and Baroque appeal to the spectacular magic and illusion, have a decisive influence on the art of French gardens. A set of mirrors is established, in which theater mimics the garden and the garden mimics the theater, the process typically baroque of double fiction. The great achievements such as Versailles, Vaux le Vicomte, Chantilly are lavishly staged and provide a framework for many performances (ballets, banquets, theater, magic waters, etc..). 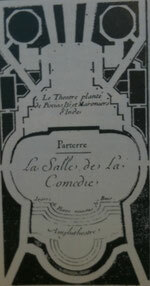 In this context where the baroque sensibility tends to naturalize the scene and artificialize the garden, the first open air theater appear in France. Hall of Comedy - Tuileries Gardens. The Hall of Comedy in the Thuileries' garden, designed by Le Notre and performed in 1670, is considered the first outdoor theater in France. This garden structure, which was functional, reflects a desire to reproduce in hard sets foliage, arranged on the occasion of celebrations of the Pleasures of the Enchanted Island played at Versailles. The green room had large dimensions (20 yards wide by 40 yards long). A masonry structure constituted the foundations of the stage, the proscenium and bleachers. Behind the scene there were perspective effects, which create illusions of space and depth. 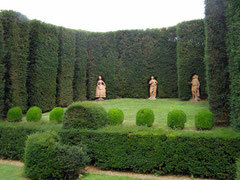 Plants that dressed and decorated this outdoor theater were boxwood, yew, spruce and chestnut from India. After the austerity of the late reign of Louis XIV, the Regency brings a breath of freedom. The fashion "home" theater or "theater company" are great success. In the aristocratic residences of Paris or province festivals and gallant rustic balls take place, such as masked balls of Sceaux, Suresnes or the Palais Royal. Parisian society is staged in a bucolic world where there are pleasure, love and joy of life, as in a depiction of pastoral life. 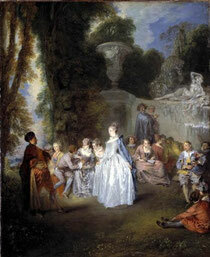 The paintings of Watteau, among others, perfectly reflect the atmosphere of these celebrations, with couples in love elegantly dressed, company busy with entertainment. His paintings transpose the artificial universe of theaters in Arcadian parks. There is an abyss into which the garden becomes theater decor, strollers become actors in Arcadian landscapes. In this context of "dramatization" of the garden, one can easily imagine that the outdoor theater, which combines the garden arts and performing arts, has been honored. 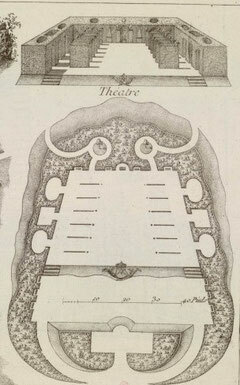 Queen Marie Antoinette, with a taste for comedy and to put herself on stage, did indeed make his gardener Richard design a green open air theater in Trianon in 1774. Simultaneously, the rococo aesthetic interweaves the outdoor theater in a network of alleys and fanciful play. This type of structure becomes a must in the creations of parks. The model also spreads everywhere in France and in Europe and especially Germany. Georges-Louis Le Rouge, a Project of Anglo-Chinese garden for an individual. 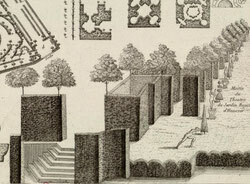 Engraved models theater to be broadcast point to the attractiveness of the building of garden. 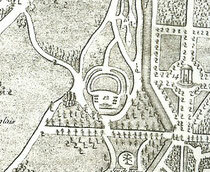 Georges-Louis Le Rouge, architect and geographer of Louis XV, quotes the double advantage in his Anglo-Chinese Garden, published between 1776 and 1788: "The theater is part of the regular routes as well as the tennis court or the carousel, or in the picturesque gardens where it is the culmination of a journey". Georges-Louis Le Rouge, a garden project Anglo-French-Chinese. Georges-Louis Le Rouge, Parc de l'Hermitage to M. le Duc de Croy near Conde. 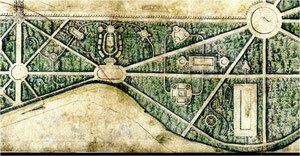 These elements of the history of green open air theaters, are extracted from the paper entitled "The greenery theaters in France" by Maryline Mallart and Marie-Caroline Thuillier, for the School of Architecture of Versailles, under the Master 2 "Historic gardens, heritage and landscape", edited by Marie-Helene Bénetière and Monique Mosser. It is available at the library of the Ecole d'Architecture de Versailles. -BENETIERE Marie-Hélène, Jardin, vocabulaire typologique et technique, Paris, Editions du Patrimoine, 2000. -BOITARD Pierre, Manuel de l’Architecture des jardins et l’Art de les composer et de les décorer, Paris, Roret, 1834. - CAZZATO, FAGIOLO, GIUSTI, Teatri di verzura : la scena del giardino dal Barocco al Novecento, Firenze Edifir, 1993. - DE CHARON Rosine, VIGNE-DUMAS Claire, « Les jardins dans l’œuvre des frères Vera », Catalogue de l’exposition Paul et André Vera, entre tradition et modernité, éditions Hazan, 2008, p.39-58. - DEGAINE André, Histoire du théâtre dessiné, Paris, Editions Nizet, 1992. 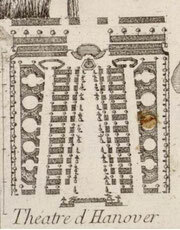 - DEZALLIER D’ARGENVILLE Antoine-Joseph, La théorie et la pratique du jardinage, La Haye, 1739 (première éd.1709). - DUCHENE Achille, FOUQUIER Marcel, Des divers styles de jardins: modèles de grandes et petites résidences, Paris, Emile Paul, 1914. - MOSSER Monique et TEYSSOT Georges, (dir. 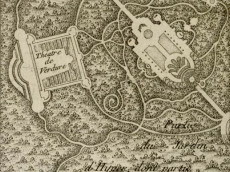 ), Histoire des jardins. De la Renaissance à nos jours, Paris, Flammarion, 2002.